Montenegro, O.I; Sfer, D.; Lopez, C.; Carol, I. 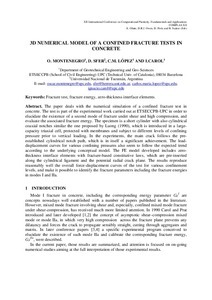 The paper deals with the numerical simulation of a confined fracture test in concrete. The test is part of the experimental work carried out at ETSECCPB-UPC in order to elucidate the existence of a second mode of fracture under shear and high compression, and evaluate the associated fracture energy. The specimen is a short cylinder with also cylindrical coaxial notches similar the one proposed by Luong (1990), which is introduced in a large-capacity triaxial cell, protected with membranes and subject to different levels of confining pressure prior to vertical loading. In the experiments, the main crack follows the pre-established cylindrical notch path, which is in itself a significant achievement. The load-displacement curves for various confining pressures also seem to follow the expected trend according to the underlying conceptual model. The FE model developed includes zero-thickness interface elements with fracture-based constitutive laws, which are pre-inserted along the cylindrical ligament and the potential radial crack plane. The results reproduce reasonably well the overall force-displacement curves of the test for various confinement levels, and make it possible to identify the fracture parameters including the fracture energies in modes I and IIa. Montenegro, O.I [et al.]. 3D numerical model of a confined fracture tests in concrete. A: International Conference on Computational Plasticity Fundamentals and Applications. "Computational Plasticity XII: Fundamentals and Applications. Proceedings of the XII International Conference on Computational Plasticity – Fundamentals and Applications Barcelona, Spain3 - 5 September 2013". Barcelona: 2013, p. 470-478.